The areas of Raleigh do not have strict limits. There usually isn’t a clear line where one area ends and another area begins. All of the areas we have talked about so far have been approximate (not exact; not precise). Midtown is also an approximate area. However, in general, when people talk about midtown Raleigh, they are talking about the area from I-440 up to Millbrook Road, from Glenwood Avenue to Six Forks Road (more or less). I’d like to tell you about a few things to do and see in midtown Raleigh. Glenwood Avenue is the yellow road on the left. It is also highway 70. It goes from downtown Raleigh, through Five Points, all the way up to I-540 and into Durham. The orange road across the bottom of the map is I-440. People in Raleigh also call it “the beltline” because it goes around Raleigh like a belt. Six Forks Road is the purple line on the right of the map. It also continues north to I-540. The green line at the top of the map is Millbrook Road. If you continue east on this road past Capital Blvd., the name of the road changes to New Hope Road. If you continue west on this road past Glenwood Ave., the name of the road changes to Duraleigh Road. Now I’ll tell you about a couple of things you can do in this area. Crabtree Valley Mall – Most of you have visited this mall already. If you haven’t been there yet, it is a large mall with lots of stores and restaurants. It has plenty of parking, but if you don’t have a car, you can take a #6 CAT bus. 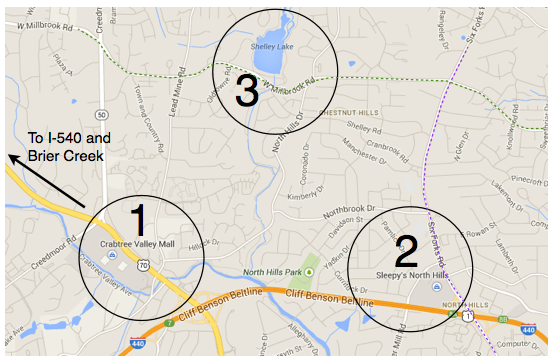 North Hills – North Hills isn’t a mall like Crabtree. It has lots of stores and restaurants, but they aren’t all together in a large building. Instead, you walk outside from one store to another. North Hills also has a Target, a movie theater, and apartments. If you enjoy eating or walking outside, you might like North Hills. It also has free outdoor concerts in the summer. Shelley Lake – Shelley Lake has a 2-mile path where you can walk, run, or ride your bicycle. It also has two playgrounds (1 for older children, 1 for younger children) and a basketball court. And if you’re interested in art, Sertoma Arts Center is located at Shelley Lake. At Sertoma, you can take classes in pottery, painting, drawing, photography, and performance arts (like dance and drama). They have classes for all ages, from preschool to adults. Tell us about your favorite thing to do in midtown Raleigh! Do you have a favorite restaurant, store, or activity in this area? Leave a comment so that other students can enjoy it too! Community, Information and Resources. permalink.